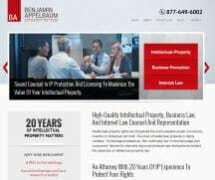 Benjamin Appelbaum is a sole practitioner and a Registered Patent Attorney. His areas of specialization include the chemical, mechanical and electro-mechanical arts. He has prepared and prosecuted patent applications before the U.S. Patent and Trademark Office, and appeals to the Board of Patent Appeals and Interferences. In the chemical arts, matters have included biomedical devices, diagnostics products and tests, and pharmaceuticals. Inventions in the electro-mechanical arts have included computer-related devices, biomedical equipment and computer software. He has advised clients on diverse matters of product development, infringement and enforcement of their intellectual property rights. Prior to attending law school, he was a research scientist at Warner-Lambert Company where he did research in the development of novel oral health care products. He has received several patents for inventions in these fields, such as U.S. Pat. No. 4828849 and U.S. Pat. No 4855128 . Benjamin Appelbaum's background includes advanced graduate degrees in microbiology, and extensive university and industrial research experience in microbiology and biochemistry. This hands-on research experience provides him with a broad scientific background and the capabilities of dealing with issues of modern biology, including areas such as biotechnology, genetics, immunochemistry and molecular biology.